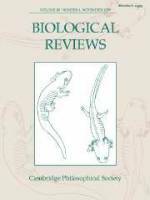 Biological Reviews covers the entire range of the biological sciences, presenting several review articles per issue. Although scholarly and with extensive bibliographies, the articles are aimed at non-specialist biologists as well as researchers in the field. Authors are specifically instructed to be aware of this fact in their writing, and the resulting reviews serve as extensive introductions to particular fields, outlining the state of the art, and drawing attention to gaps in knowledge. Articles are up to 20,000 words long and each contains an abstract, a thorough introduction and statement of conclusions.